So far this season, the Atlantic Basin has seen two named storms. Bertha’s formation date of July 31st was right on par with climatology, as the average date of development for the second named storm is usually right around August 1st. Similarly, we are right on schedule in terms of seasonal hurricanes…as Arthur passed off the Eastern Seaboard earlier in July. With that being said, what can we expect during the coming weeks and beyond? Will this hurricane season continue to feature near normal activity, or will it trend below normal as we head into the peak months of tropical development? 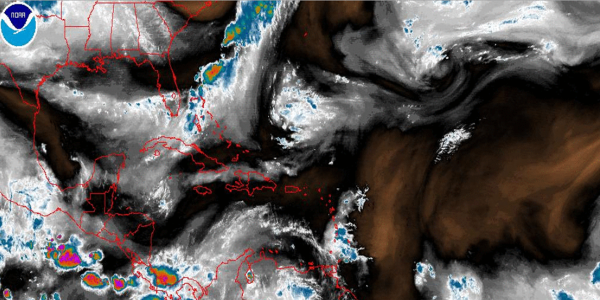 If you are interested in what is expected to transpire, especially if you are planning on travelling to the Caribbean during the next few months, then read ahead and get a peek into the upcoming forecast. Despite the near average start to the hurricane season, general activity levels are expected to tail off, at least compared to climatology, as we head into August and September. The main reason for this includes largely unfavorable conditions across the main development region of the basin (between the West Coast of Africa and the Lesser Antilles), namely, dry air and a lack of instability. 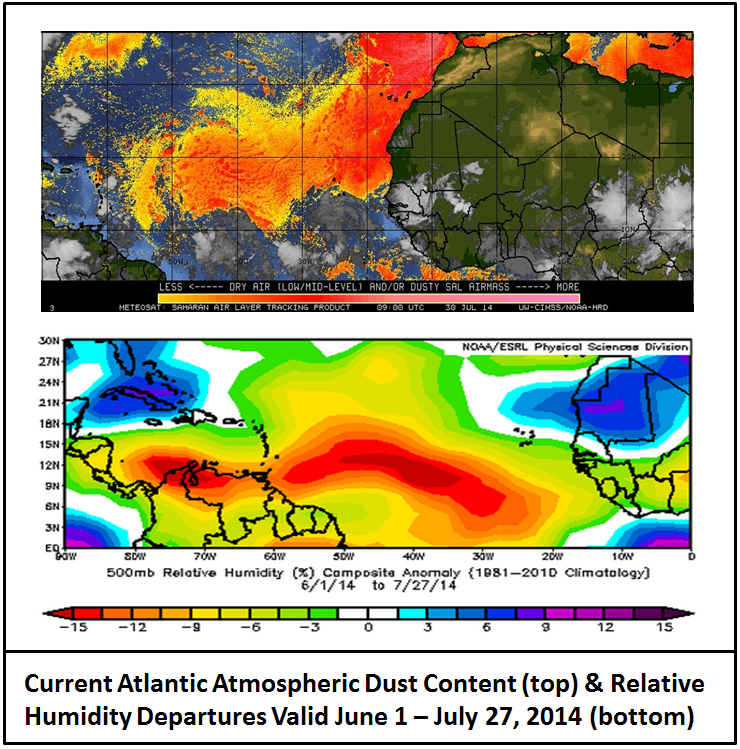 The figure below shows a dual panel of images depicting both Atlantic dust content and relative humidity departures from June 1st through the most recently available date at the conclusion of July. Notice the expansive area of dust across most of the central and eastern Atlantic Ocean, which is represented by the yellow and red shadings. This high concentration of dust, which originates over Africa, has contributed to higher than normal levels of dry air across the basin for the first two months of the hurricane season. This dry air is shown in anomalous relative humidity values, which have been running around 10 to 15 percent below normal through this time. Dry air is often referred to as the enemy of tropical cyclones, and inhibits development by contributing to a stable atmosphere. Because of the enhanced stability, thunderstorms are not able to develop and grow as easily…which ultimately reduces organized tropical development. There is no sign of these hostile conditions letting up as we head into the heart of hurricane season. As such, the earlier prediction of below normal activity still stands as we move into autumn. One caveat to note, however, will be the state of the Madden-Julian Oscillation as we head into the first half of August. For those of you not familiar with the MJO, it is simply a way of monitoring areas of enhanced clouds and thunderstorms across the global tropics. Some phases of the MJO have been linked to an increased likelihood of organized development across the Atlantic Ocean, while others have been known to inhibit said development. Although the MJO has been relatively inactive so far this summer, current forecast models hint at it playing more of a role in terms of tropical weather as we head into the near future. The attached dual image shows the current projection of the MJO through August 30 along with historic precipitation departures associated with each phase. Note how during the first half of August the MJO is expected to rotate counterclockwise through phases 7, 8, and 1 before weakening as it heads into phase 2. All these phases have to some extent been linked to enhanced moisture and precipitation across the Atlantic, which may help to counteract the dryness due to the excess amount of dust and low relative humidity across the basin. As such, heading into mid August there may be increased chance of development. After that time, however, conditions should trend relatively inactive once again. Additionally, although it has not fully come to fruition yet, a developing El Niño (albeit rather weak) is expected to enter the equation as we enter fall. Recall El Niño conditions are often associated with suppressed activity and should curb organized tropical development event further as we head into October and ultimately November, as well. This fact, along with the already unfavorable conditions continue to point toward decreased organized tropical activity as we head through the remainder of the season. With that being said, we cannot say with 100 percent confidence that we are totally out of the woods. Remember, it just takes one intense tropical cyclone to make a lasting impression for the year.